I almost always use the food processor for this homemade egg pasta dough recipe, as it makes quick work of the task. But I feel it’s also worth knowing how to mix pasta dough by hand. For one thing, nothing chases away fear in the kitchen like rolling up your sleeves and getting your hands dirty. For another, making egg pasta is a tactile experience. The more you touch and handle the pasta dough, the more familiar you’ll become with the proper consistency—how firm and how smooth it should be. If you have yet to travel to Italy and sit in a trattoria with a plate of proper homemade egg pasta in front of you, there’s only one thing that can even begin to approximate that experience. And it only takes 25 minutes. What are you waiting for? Although we’re partial to all shapes of pasta, we’re especially enamored by these Ravioloni (aka Giant Ravioli). 1. To mix the pasta dough recipe in the food processor. Put 2 cups “00” flour, the 1 tablespoon semolina, salt, and nutmeg into the work bowl and pulse briefly to combine. Break the eggs into the work bowl, drizzle in 1 tablespoon of the olive oil, and process the mixture until it forms crumbs the size of small curds. Stop the machine and pinch together a bit of the mixture between your fingertips and roll it around. It should form a soft ball. If the mixture seems dry, drizzle in another tablespoon of oil and pulse briefly. If it seems too wet and sticky, add additional flour, 1 tablespoon at a time, and pulse briefly. Turn the mixture out onto a clean work surface sprinkled lightly with semolina flour and press it together with your hands to form a rough ball. To make the pasta dough recipe by hand. Combine 2 1/4 cups “00” flour, the 1 tablespoon semolina flour, salt, and nutmeg on a clean work surface and pile into a mound. Make a well in the center of the mound, and break the eggs into it. Drizzle 1 tablespoon of the olive oil into the well. With a fork, break the egg yolks and whisk together the eggs and oil. Using the fork, gradually incorporate just enough of the flour from the inside wall of the well into the egg mixture to create a batter-like consistency. Work carefully so that you don’t break the wall of flour, causing the egg mixture to run out and cause a mess. (Although if this happens, don’t panic. Just use your palms to scoop up the egg mixture and work it back into the flour.) Now, use your hands to draw the remaining wall of flour over the thickened egg mixture and gently knead it just until it is incorporated. 2. Using the palm of your hand, push the egg pasta dough gently but firmly away from you, and then fold it over toward you. Rotate the it a quarter turn, and repeat the pushing and folding motion. Continue kneading in this fashion, using a scraper to dislodge any dough stuck to the work surface. It will begin as a shaggy mass but will eventually turn smooth as you knead it over several minutes. You may not use all of the flour on the work surface. When the dough is smooth and silky, form it into a ball and wrap it tightly in plastic wrap. Let it rest at room temperature for 30 minutes. 3. Before you roll and shape the pasta, keep in mind that how thin you roll the pasta will depend on what you are making, so be sure to carefully read the individual recipes and instructions. Most recipes, including those for ravioli and lasagne, call for stretching the pasta dough very thin—about 1/16 inch. On my machine, passing the dough through the second-narrowest roller setting (#6) produces a very thin pasta sheet. I usually don’t go past that setting when I’m making ravioli, although if making noodles, you might prefer to use roller setting #5 or even #4 for a more satisfying bite to your pasta. 4. Set up your pasta machine with the rollers on the widest setting (#1 on my standard Marcato Atlas machine). Scatter a little semolina flour on the work surface around the machine and have more on hand for sprinkling the dough. Divide the pasta dough into 4 equal pieces. Re-wrap 3 pieces and set aside. Knead the fourth piece briefly on the work surface. Then, using a rolling pin or patting it with the heel of your hand, form it into an oval 3 to 4 in long and about 3 inches wide. Feed the dough through the rollers of the pasta machine, then lay the strip on your work surface. Fold the dough into thirds, as if you were folding a letter, sprinkle with a little semolina, and pass it through the rollers again. Repeat the folding and rolling process a few more times, until the strip of dough is smooth. 5. Move the roller setting to the next narrower notch and feed the strip of dough through the setting twice, sprinkling it with a little semolina each time to keep it from sticking. Move the notch to the next setting. Continue to pass the pasta dough through the rollers, twice on each setting, until you have stretched it to the appropriate thickness. 6. Once you’ve stretched the pasta dough (it will be a fairly long ribbon, depending on how thin you’ve stretched it), lay it out on a semolina-dusted surface (my mother would sprinkle an old tablecloth with semolina, but a clean dish towel works well), and cover it lightly with plastic wrap while you stretch the remaining 3 pieces in the same fashion. 7. After rolling the pasta dough cut it into the shape you desire by hand or with a machine. 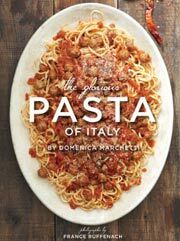 (Editors’ Note: We’ve got some terrific tips on cutting pasta by hand.) If making noodles, such as tagliatelle, linguini, spaghetti, etc., place a wire cooling rack on a rimmed baking sheet. Toss the cut pasta with a considerable amount of semolina flour (don’t worry about using too much flour, as it’ll fall off in the boiling water), and arrange the noodles on top of the rack in small piles. Use the pasta within the hour. If you plan to cook the noodles later rather than sooner, sprinkle a baking sheet with plenty of semolina flour and place the pasta directly on the sheet in several small piles. Slip the baking sheet into the freezer until the pasta is firm. The pasta will keep for a month stacked in a large container with a tight fitting lid or in zip-top freezer bags. When you’re ready to use it, just drop the frozen pasta into boiling water. 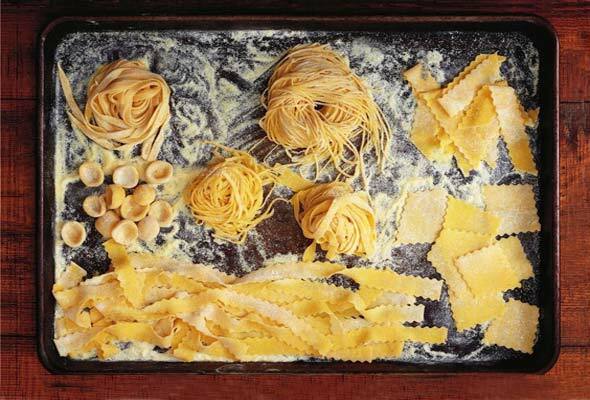 Freezing pasta will work for any shape you cut, either filled or unfilled. The pasta dough turns out to be very pliable and I will use this easy recipe to make pasta dough in the future. Even at its thinnest, it was relatively easy to handle. This was my first time making pasta from scratch, and this recipe looked like the perfect foil for my untrained hands. This dough is incredibly forgiving—I didn’t have extra-large eggs or semolina flour and it still came together smoothly. I just added a little extra olive oil. The fact you can make this in a food processor makes it foolproof. I’d recommend this recipe to anyone who has been nervous about making your own pasta. It’s a great way to start and I’ll be using this recipe again and again! Fresh Homemade Egg Pasta Dough Recipe © 2011 Domenica Marchetti. Photo © 2011 France Ruffenach. All rights reserved. All recipes and photos used with permission of the publisher.